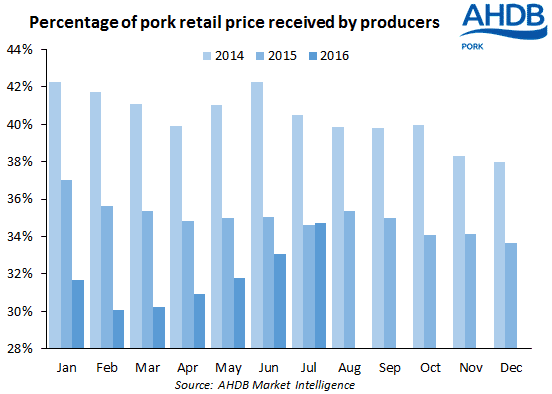 UK - The sustained recovery of UK pig prices since the spring has come at a time when retail pork prices have been fairly stable. As a result, the share of the retail price received by producers has risen from a low point of 30 per cent to reach 35 per cent in July. This was the highest figure since last September and almost the same as in July 2015. Nevertheless, it remains well below the 40 per cent+ share received by producers for much of 2014. While pig prices in July were still 5 per cent lower than the same month last year, retail prices had also fallen by the same percentage, on average. Although overall retail prices were stable in July, there was some movement for individual cuts, according to AHDB’s retail price survey. In particular, loin steaks were 4 per cent cheaper than in June, while pork mince was 2 per cent more expensive. Prices for diced pork and shoulder rose by a little over 1 per cent but movements for other cuts were smaller. Compared with July 2015, prices for all monitored cuts were lower this year. The biggest falls were for boneless shoulder (-9 per cent), loin chops (-7 per cent) and steaks (-6 per cent) and traditional pork.